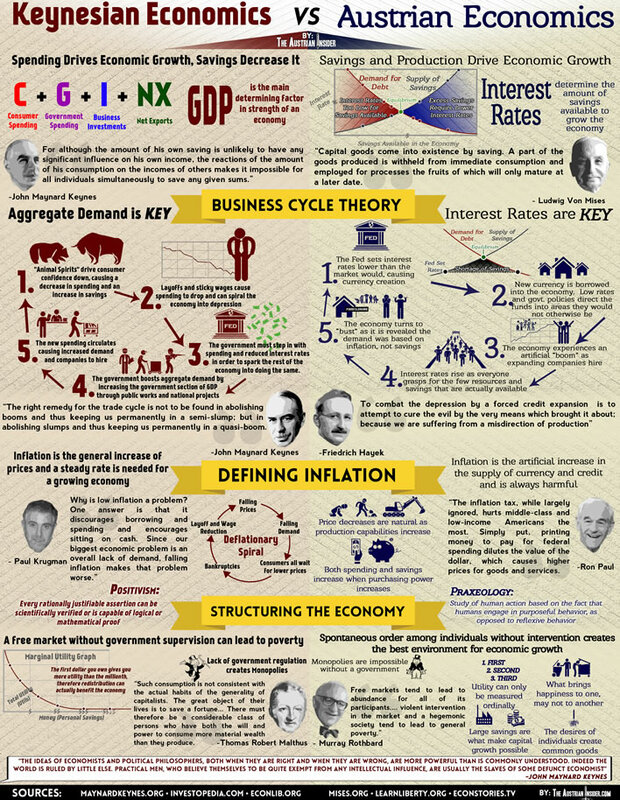 Infographic 'Keynesian vs. Austrian Economics', by Sean Aranda, at The Austrian Insider website. The site has larger, downloadable versions of the graphic. This non-economist has only two comments on this interesting graphic. How can we non-economists take the 'science' of economics, the 'dismal science' on which so many aspects of our lives seemingly depend, how can we take it seriously when it seems to be based on two mutually exclusive theoretical models – and has been for at least the last fifty years without any resolution. Isn't this really a bit of a worry? Unqualified to judge, I can only resort to that raddled strumpet, common sense. Thus when I read the two Keynesian panjandrums in the UK Daily Telegraph, Evans-Pritchard and Warner, suggest that our economic woes stem from the fact that we are not destroying enough material and value and that we should be spending money on possibly pointless 'grands projets' such as the war on global warming I need to pause for thought. If I have to choose I think I'll stick with von Mises Austrian viewpoint and Frédéric Bastiat's shopkeeper's window. At least that makes sense. ^ The Second World War lifted the global economy out of a low-growth liquidity trap by flattening excess industrial capacity and harnessing a glut of static savings. This was the launchpad for the rebuilding boom of the 1950s and 1960s. ^ I’m not suggesting the US needs another moon shot to lift it out of its psychological funk, but it does require something, and it is just possible that the climate change agenda might provide it. This may admittedly struggle to inspire in quite the same way as the space programme, but it promises a potentially much bigger economic dividend. The sort of investment and innovation needed to switch from today’s dependence on hydro-carbons to an energy infrastructure based on solar, wind, wave, tide and nuclear makes the space programme look trivial by comparison.